• 410 cats and 342 dogs have found forever homes, including long-time residents Captain 'Merica and Roxie. 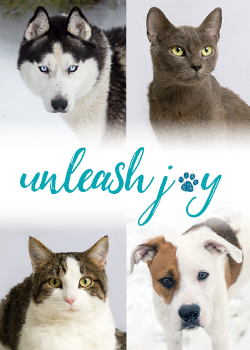 • 480 cats and 372 dogs have come to PAWS to begin their journey to find a new best friend. We could not make a difference in the lives of these cats and dogs without our adopters, volunteers, fosters, donors, and supporters! We still have more animals that need your help. Below you will find a list of different ways you can donate to help our animals. Please make a gift to PAWS and unleash the joy of the holiday season. You can donate to PAWS via our online form. Your donation can be made in honor of someone, which makes a great holiday gift for the animal lovers in your life! You can also donate to specific funds like On the Mend Fund for medical needs or the Good Dog Fund for training. Or check out our Amazon Wishlist to donate specific items we are in need of and don't forget to select us as your AmazonSmile charity by clicking here! Click here to sponsor a cat or dog for $25, which helps to support food, shelter and medical expenses for an animal for a month. Become a Guardian Angel and sponsor the adoption fee of an adoptable PAWS cat or dog. When a forever home is found for an adoptable in the Guardian Angel program, the adoption fee is waived since it is covered by their Angel! Guardian Angel donations also help cover the cost of those animals who have been at PAWS for a long time.